In mid November, chef Zeb Stevenson let it slip that he was taking over as executive chef at Inman Park’s Parish, a title formerly held by Edward Russell. Around the same time, word got out that mixologist Arianne Fielder was leaving Article 14 after only a few months behind the bar. Coincidence? It appears not. 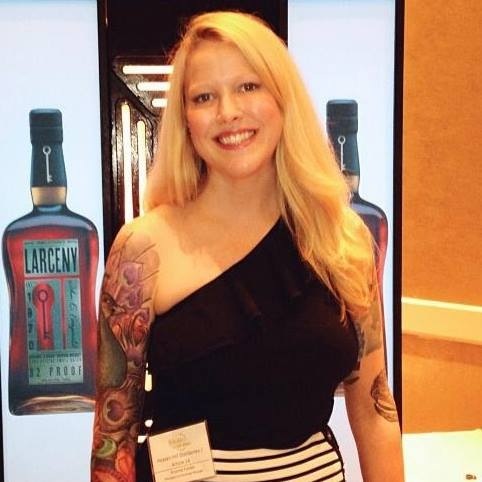 Fielder, who worked previously as beverage manager at Drew Van Leuvan’s Seven Lamps, confirmed that she has taken over the newly created head mixologist position at Parish, leaving former Seven Lamps lead bartender Leo de Rivera to make drinks at Article 14. We caught up with Fielder who explained her reason for making the jump and offered insight into her new cocktail program. Why did you decide to take the job at Parish? Zeb was a big selling point for me. I’m excited about going back to a chef-led program where I have the opportunity to do more unique things and more forward thinking [cocktails] creatively. Ever since the program I did at Seven Lamps, I’ve wanted to go back to being teamed up with a great chef I can really work off of, and do something different from everyone else in Atlanta. As Zeb put it, nobody has brought the spirit of the [Parish] building to life. It’s our goal to finally bring it to life. Similarly, what made you want to leave Article 14? I won’t say anything against Article 14. It was a great landing spot for me. I like what we created there—a whiskey bar—which wasn’t in Midtown before. I’m proud of what we did there. Leo [de Rivera], my lead bartender from Seven Lamps, is taking over the cocktail program. I know he’ll do a great job. I just really wanted to do more cutting-edge things that didn’t fit in that restaurant. What’s your relationship with Zeb? We haven’t worked together before, but we were friends within the food community. We did a seminar at Taste of Atlanta together. It’s kind of a quirky thing because quite a few people have pointed out we’d be a rock-star team. We talked about opening a restaurant together and now we’re doing it. We want to change the direction to have a more neighborhood feel. We want it to be friendly and inviting and fun, from the cocktail program to the fun wine list that Justin Amick’s doing. Is the New Orleans aspect going away? Yes. The restaurant is going to be more dedicated to the feel of the neighborhood. There will be a redecorating as well. There will be a re-face in all directions. As of now, we are doing Tuesday to Sunday dinner service and Saturday and Sunday brunch. Zeb’s doing a lot of preserved foods and putting an emphasis on bar snacks. For Taste of Atlanta, he did these sourdough griddlecakes. He’s getting back to classic cooking and beautiful simplicity. I know he’ll have an emphasis on preserving food, cool snacks for the bar and also finally utilizing the oyster bar. When will your new drink list be ready? We’re hoping for the new year. Right now we’re just getting acquainted with the space. Zeb started two weeks ago. My first official day was Tuesday. We want to get in there and get the vibe of the space. Right now Zeb is serving the old menu and specials, which is what I’ll be doing for the first couple of weeks. Our goal is to have something exciting fun and new for January. What’s your approach to the cocktail list for Parish? Zeb was talking about cooking with pots and pans and simplifying which is funny because that has not typically been his style. He was making perogies the other day. He’s doing a back to basics. For me it’s going to be the opposite—a unique spin. I’ll be using innovative techniques and ingredients you don’t typically see in cocktails. Maybe we’ll have savory cocktails. One has carrots and dill in it. I’m bringing back sous vide cocktails and infusions. I’ll keep it around ten cocktails at the beginning to get it launched and make sure it’s executed properly. What spirit(s) will you focus on? We’ll have a nice selection of whiskey. That fits the city everywhere but the cocktail program overall won’t be geared toward one particular spirit. We’ll use small batch, local, craft spirits. Thursday we’re doing a repeal day event, teaming up to raise money for Old 4th Distillery. I’m doing classic cocktails. Zeb will do small bites. We want to support local craft [distilleries]. Back to your plans for Parish, will you be doing pairings? Absolutely. Beer dinners, wine dinners, cocktail dinners—that will be a big focus. As far as actual written menu pairings, that gives us something to talk about—maybe putting a beverage suggestion with dishes. Zeb and I both feel very strongly about being available in the restaurant to help with pairings. I’ll be in the dining room all of the time. Zeb is a very front-of-house chef. He’s not shy about coming out and talking to guests.